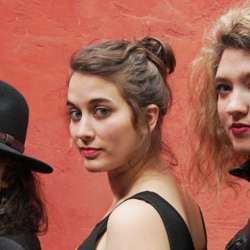 Emerging French trio, Samaïa, get their name from a Georgian traditional dance in which three women twirl as one body (that of the first Georgian queen, Tamar). With stunning voices that blend but never touch, the group celebrates, mourns and re-invents songs from all over the world. Singing mainly a-capella, Samaïa showcase the strength of the unaccompanied human voice and its capacity to move the soul. The trio, whose line-up includes SOAS alumnus Luna Silva, have just released their first self-produced album.